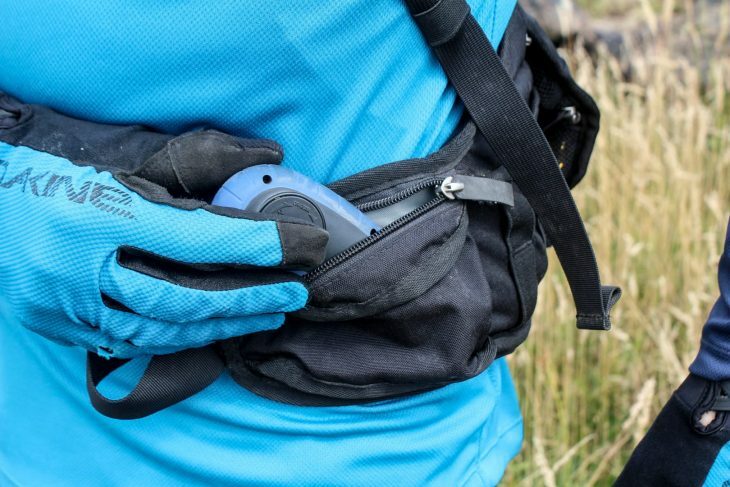 Bum bags (or Fanny Packs, as they’re also affectionately known) have evolved to become one of the hottest trends in mountain biking of the past few years. Though fashion surely has had a lot to do with it, bum bags and fanny packs aren’t just a passing fad. 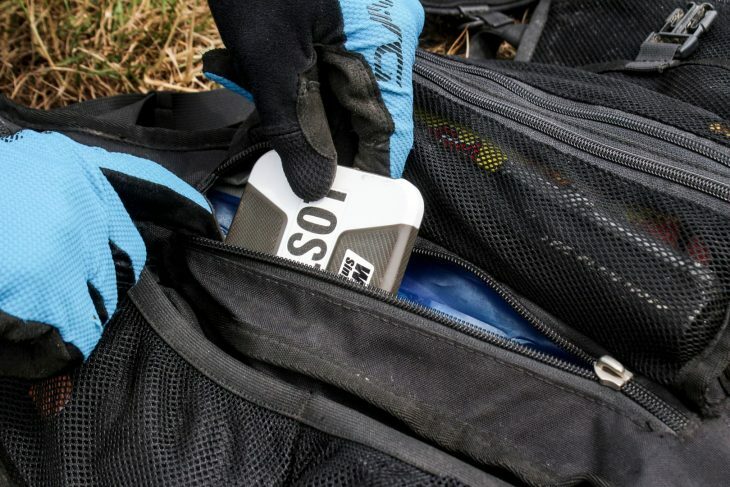 Compared to a traditional backpack, these waist-carried packs offer some useful benefits for riding, the biggest of which is in lowering the centre of gravity to sit closer to around the rider’s hips. And by removing the harness of a traditional backpack, you can also enjoy more breathability over your back, and greater freedom of movement too. Bum bags have their limitations though. There’s only so much you can fit inside them, and if you properly load them up with a full reservoir of water, plus all the pork pies and beer tickets you’d need for a solid few hours of riding, they can end up a bouncy, uncomfortable hindrance that digs into your belly and flops about while pedalling. The solutions to this conundrum are varied. Of course you can just carry less stuff, and that’s what I usually do when using a bum bag for shorter rides. Then there’s the approach of the Source Hipster – a bum bag that uses a set of braces over the shoulders to support the pack’s load. 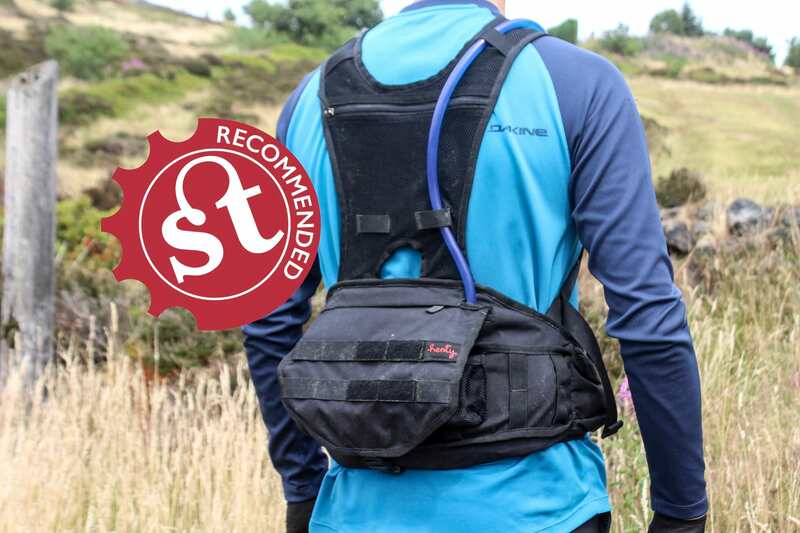 I’ve tested the Hipster before, and found it to be a brilliant option for being able to carry a decent amount of water, without being subjected to the dreaded pack-flop (read our ‘Singletrack Recommended’ review here). 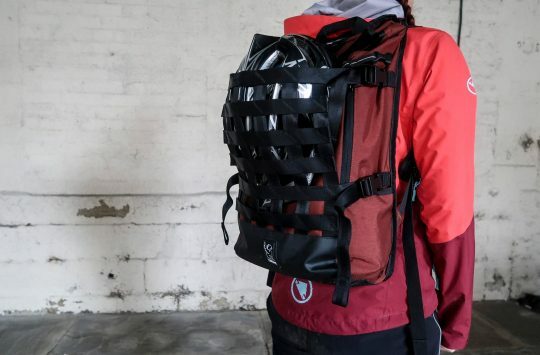 Joining the likes of the Source Hipster, and designs from Wingnut, the Enduro Backpack is a new option in the not-quite-a-bum-bag-or-a-backpack market, and it comes from an Australian company called Henty Designs. 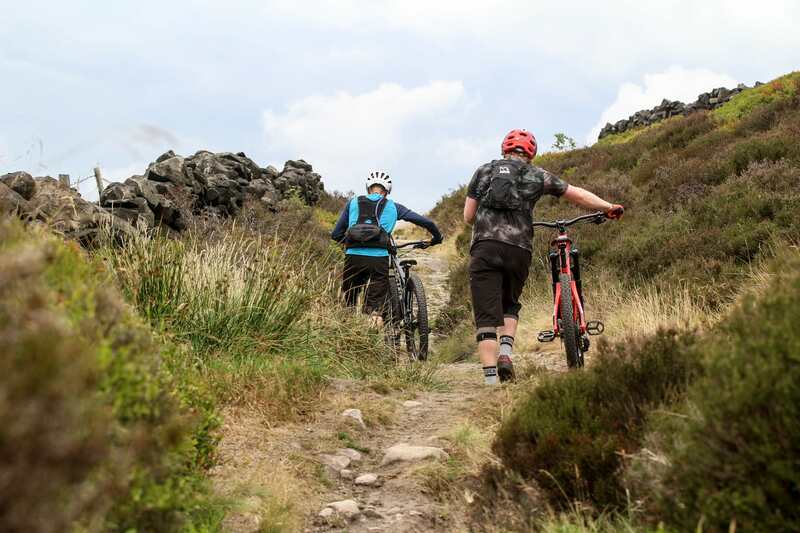 The Enduro Backpack is Henty’s first product for mountain bikers. Based out of Tasmania (but distributed and sold worldwide), Henty Designs is mostly known for its range of commuter packs and clever solutions for city workers looking to carry their spangly suits by bicycle. At the beginning of 2017 though, Henty started working on its first pack for mountain biking. 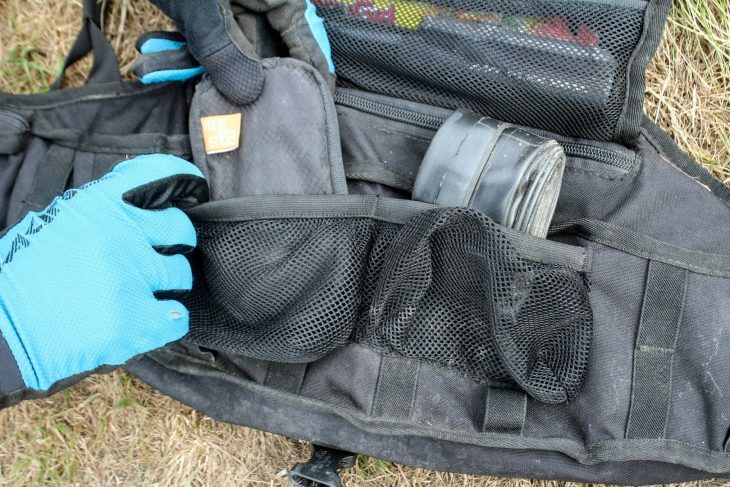 The company saw a gap in the market for a smaller-sized day riding bag that proportioned its weight in a more ergonomic configuration. The first prototype was soft-launched at the Derby EWS round last year, and following a number of refinements, turned into the production bag that you see here. The pack’s centre of gravity sits low around your waist, like a bum bag. Is It A Bum Bag? Or a Backpack? Well (and despite the name), it’s kinda both. The Enduro Backpack is a hybrid – it isn’t quite a full backpack, nor is it really a bum bag. I suppose the easiest way to describe it is as a tough and full-featured bum bag that has a harness, but that might be selling it a bit short. 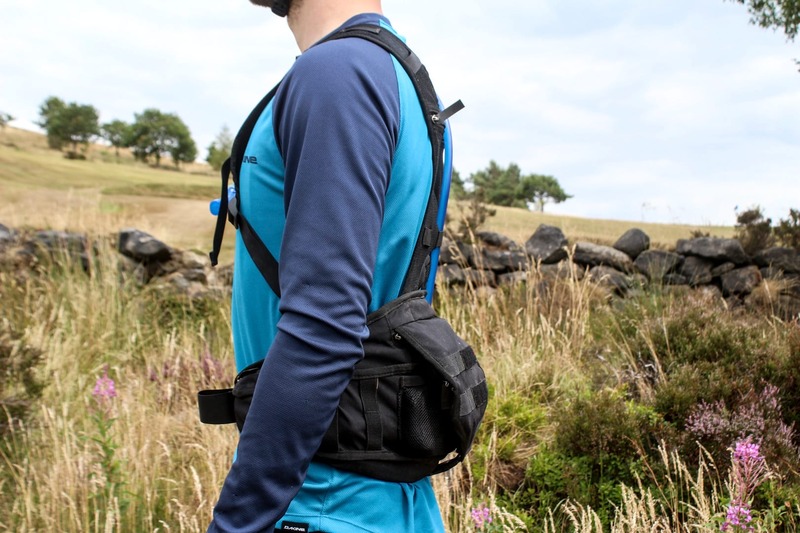 The general idea is to capitalise on the benefits of the bum bag revolution – those being the lowered centre of gravity, improved flexibility and breathability – while addressing the shortcomings of a pack that uses a single strap around the rider’s waist. In the case of the Enduro Backpack, a lightweight mesh harness is added to help support the pack weight over the shoulders in a relatively unobtrusive way. The new generation packs have reinforced zipper tabs. I’ve been testing one of the earlier production versions since the start of this year, but I had an issue with one of the zipper tabs on the main compartment. 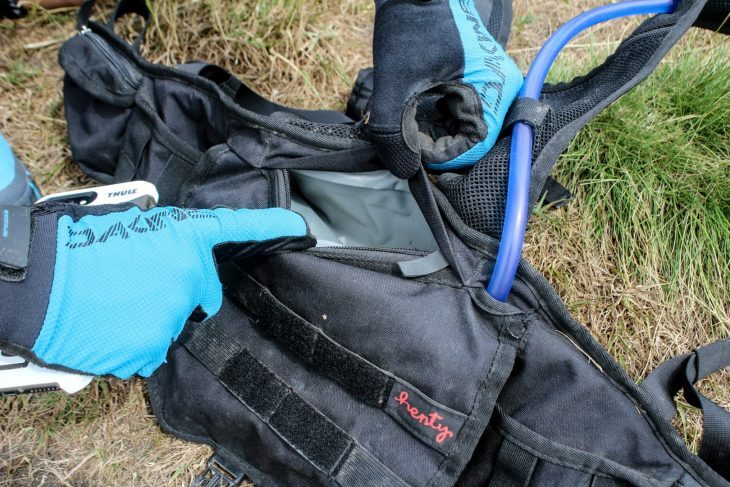 Henty sent out a replacement pack, which features redesigned zippers and a few updates to hose routing and storage. This is now the pack you’ll get if you order one from Henty, and as well as the ‘Shy Black’ tested here, it’s also available in a jazzier camo finish. What Can You Carry In It? This isn’t exactly an expedition-level pack, but it does have some clever storage solutions to make it useful for multi-hour rides out in the hills. There’s room for a full 3L reservoir, and plenty of spares and tools. Using a simple flap-closure that’s secured by a buckle and an adjustable strap, the Enduro Backpack is made from tough Cordura fabric and features a total volume of 5 litres (3L bladder & 2L storage space). 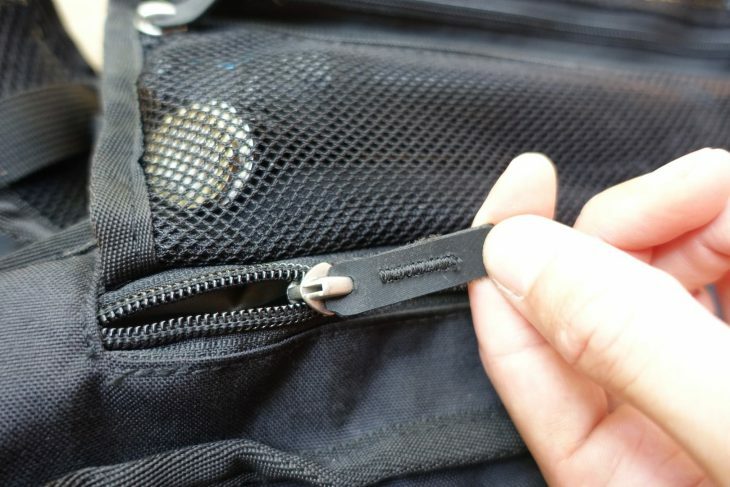 Lift up the flap and you’ll find the main zippered compartment, which is where the water reservoir sits. Henty doesn’t include a bladder with the bag – it’s a BYO affair. I’ve been using a 3L Camelbak Crux bladder, which is a standard sausage-shaped bladder that normally sits in a backpack vertically. Here though, the bladder sits horizontally instead, sitting low and wrapping around your waist. 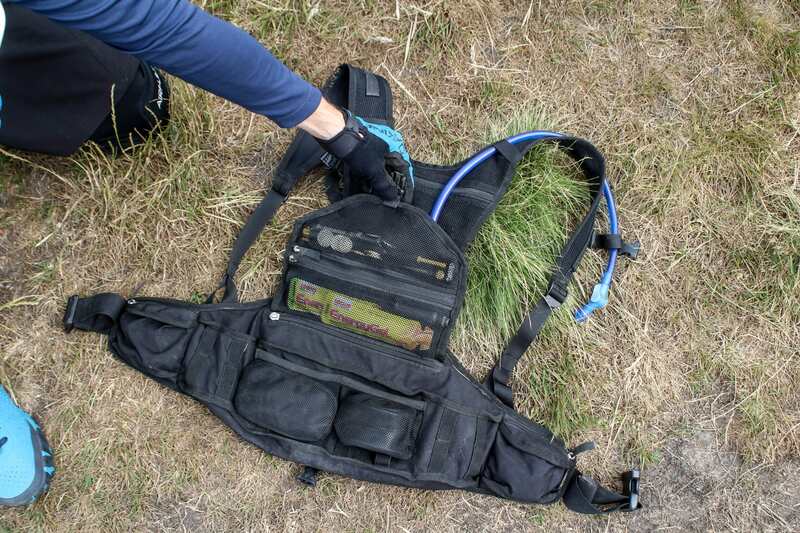 The hose exits the compartment and routes up and over the shoulder through guides in the harness. The pack is made from tough Cordura fabric. The main flap is secured by an adjustable buckle. The pack will accommodate a standard 3L bladder, just turned on its side. Underneath the flap you’ll find two zippered pockets, which are just long enough to fit in a small pump. I’ve also got a compact shock pump stowed in one pouch along with some emergency gels and cash. 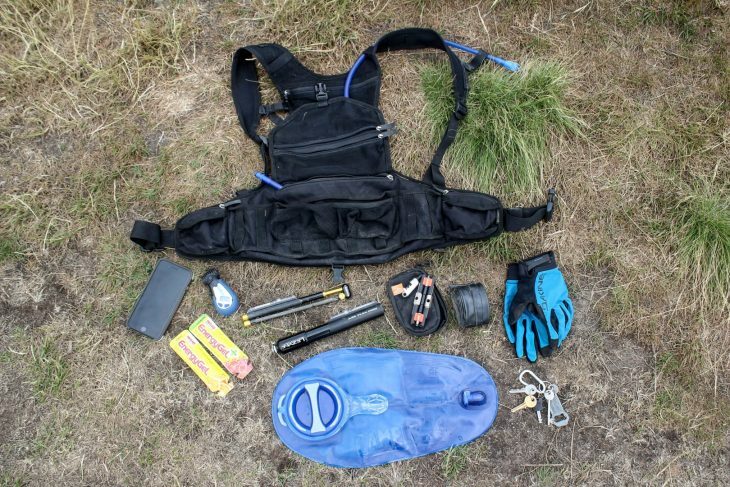 Two more mesh pouches on the body of the pack provide room for a spare tube, a tool kit and spares. The two zippered pouches are ideal for small pumps and loose spares. 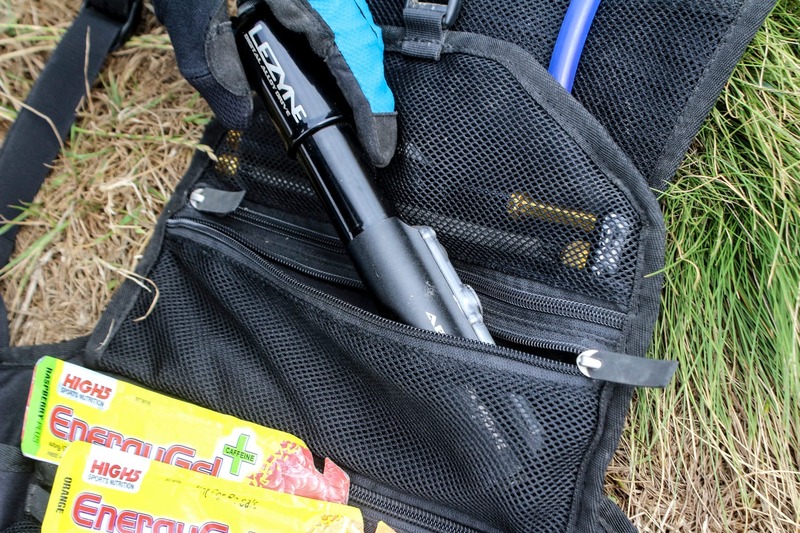 Two bigger elasticated pouches can be used for a spare tube and a tool kit. On each wing of the Enduro Backpack you’ll find a zippered pocket, which I’ve mostly used for carrying a pressure gauge and a multi-tool. 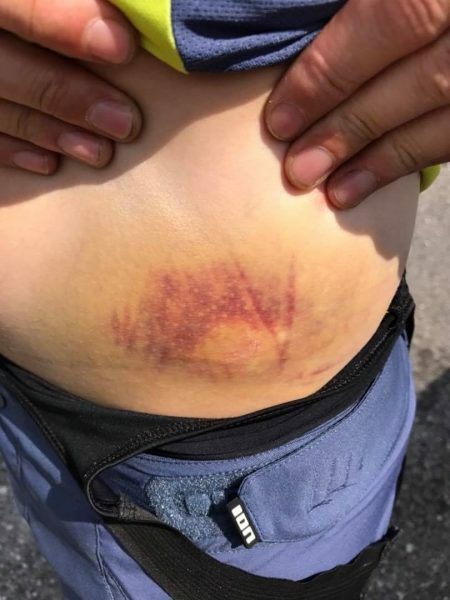 Recently though, I crashed heavily on an alpine trail and managed to smash the alloy pressure gauge between my hip bone and a rock slab. The hematoma lasted a fortnight, and since then I’ve only carried soft energy bars and snack food in these waist pockets. There’s a zippered waist pocket on each ‘wing’ of the pack. After this crash, I don’t recommend putting hard things in the waist pockets. There’s more storage integrated into the mesh harness itself, with slots for gels on the front of the shoulders, and a zippered pouch on the back. Personally, I prefer to leave these vacant to ensure airflow isn’t impeded, but for colder conditions where breathability isn’t so much an issue, there is room in this rear pouch to stow a lightweight outer shell. Henty has also built in a discreet phone pocket, which sits between the reservoir compartment and the padding. Personally, I found having a phone in here was too noticeable on my back, so instead I just put my phone and wallet in the same compartment as the reservoir. A discreet phone pocket sits behind the bladder compartment. I prefer to put my phone and wallet in with the bladder though. For longer days out, there is also some overflow storage. 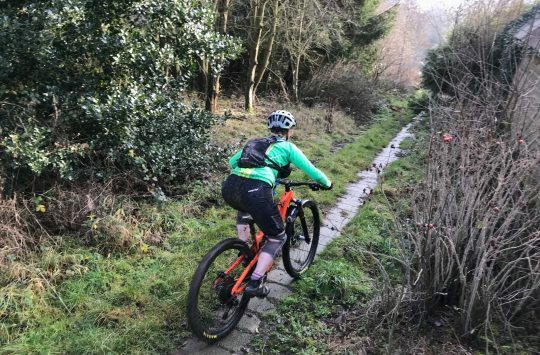 I’ve been able to make use of the flap and adjustable strap to secure a rain jacket on longer rides, and on 2-hour alpine climbs under the sun, it’s also the ideal spot to wrap up some knee pads. All in all, there’s a surprising amount of carrying capacity in the Enduro Backpack. Though its size encourages you to pack less in the first place, with its various nooks and crannies, it’s a pack that also encourages you to pack smart. 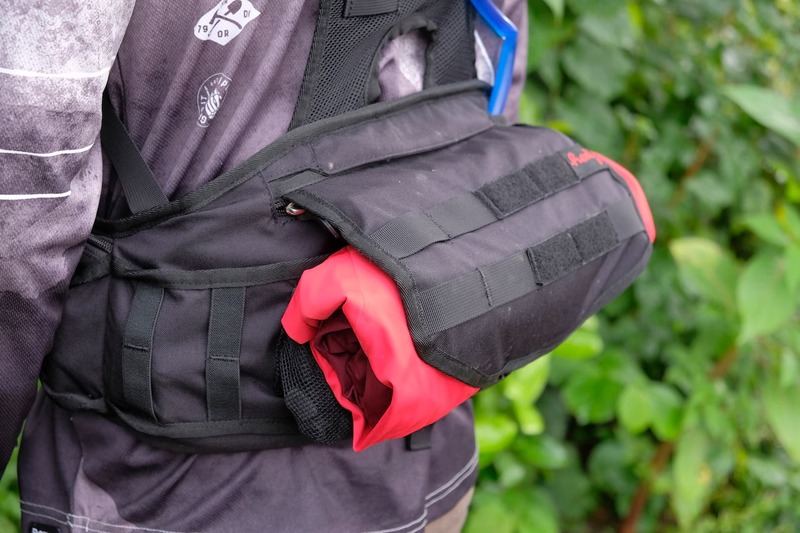 The new design has an adjustable strap, which allows for overflow storage to fit underneath the flap, such as knee pads or a waterproof jacket. From the very first ride with the Enduro Backpack, I have loved how comfortable and stable this pack is. The low-lying reservoir wraps closely around your waist, and the whole pack fits snugly and securely. The low centre of gravity is really noticeable – in a good way – and it’s to the point where I now struggle going back to using regular backpacks that, in comparison, feel cumbersome and top-heavy. The waist strap does need to be done up reasonably tight, since it’s the main load-bearing element of the entire harness. The shoulder harness can be left a touch on the loose side though, since it’s more there for stabilising the pack. 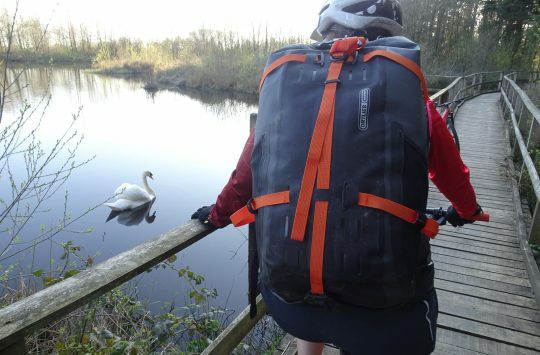 Even with a full 3 litres of water and every pocket and pouch packed to the brim, the Enduro Backpack remains impressively steady with negligible bounce. The weight is well supported on the hips, and it never feels like the main strap is digging into your tummy. For carrying a full 3 litres of water, the Enduro Backpack is the most comfortable pack I’ve used. And surprisingly, the water in the reservoir doesn’t seem to slosh around while riding through corners on the trail. The trick here is to ensure that you squish out all the air when you’re filling it up with water. Without any air bubbles inside, and with the waist strap done up securely, there is less movement to begin with. However, as the water level drops throughout a ride, you will need to tighten up the waist buckle once or twice to adjust for the change in pack volume. On hot days, the mesh harness is more noticeable compared to a regular, harness-less bum bag – that there is no denying, and you will get more sweat down your back. However, the end result is a pretty good compromise in breathability between a bum bag and a traditional backpack, with the open eyelet mesh fabric doing well to disperse and evaporate sweat. Also, there is much less pressure on your shoulders thanks to the thin, low-profile straps, and the fact that the weight is so well supported around the hips in the first place. It is very comfortable, and the weight is very well distributed. 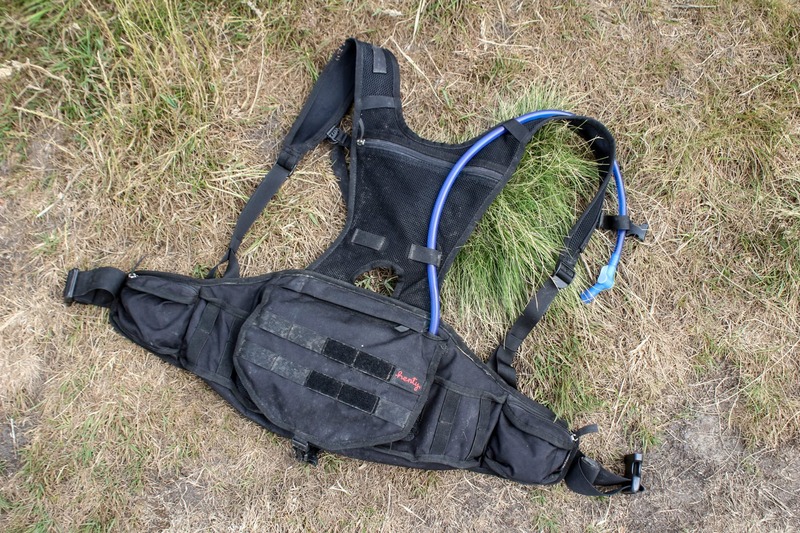 The lightweight mesh harness does well to support the pack weight. I really, really like this pack. It’s robust and well-made, and it effectively combines the comfort and low centre of gravity of a bum bag, with the stability of a backpack. 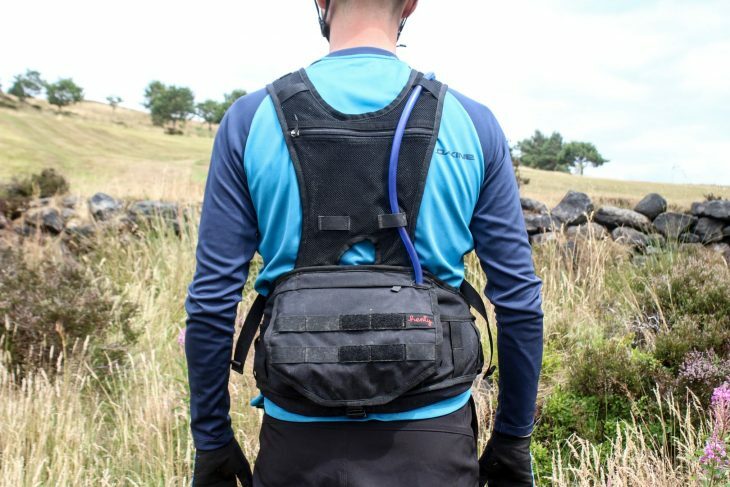 Unlike a bum bag though, the Enduro Backpack allows you to carry a full 3 litres of water without any untoward bouncing, and combined with its various pockets and pouches, it’s a much better option for longer rides and all-day exploits – particularly if you own a bike that doesn’t have water bottle mounts. It’s two thumbs up from me! 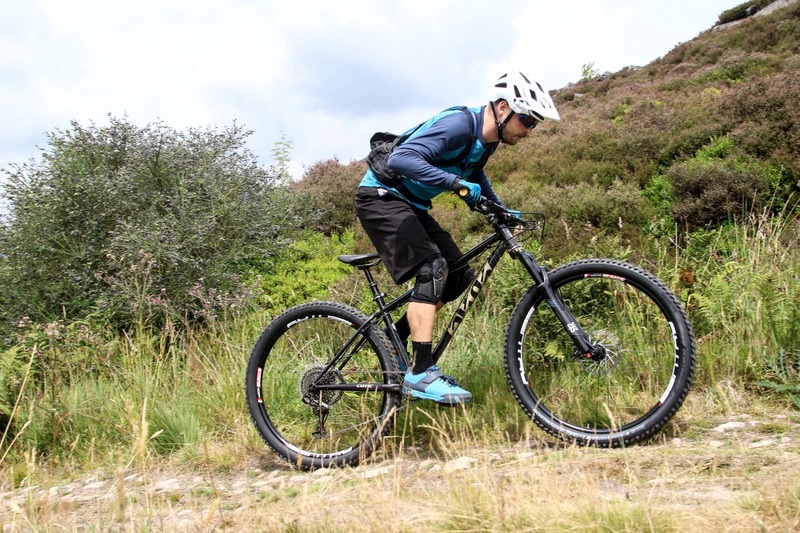 New Rocky Mountain Thunderbolt Alloy Launched. A Whyte T-130 Killer? All the ugliness and compromise of a bum bag but still with sweaty rucksack straps on it. What about mud flying up and getting under the flap? 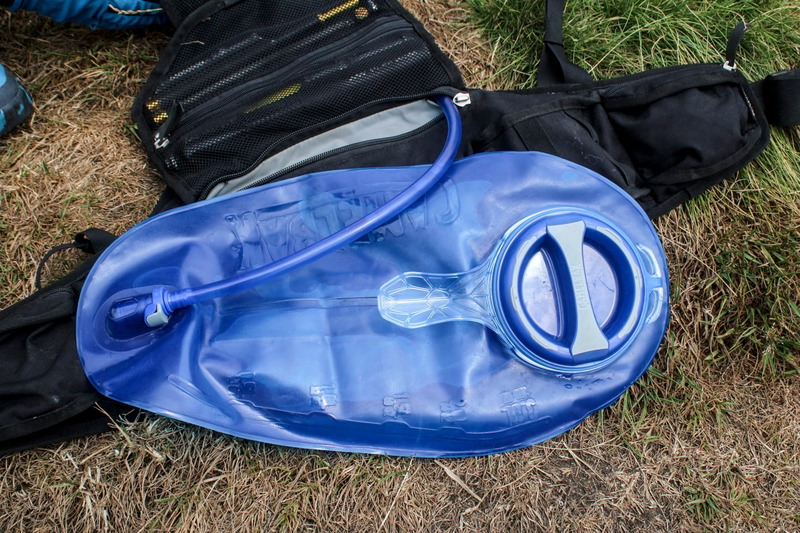 Using the camelback bladder horizontally – doesn’t your water become inaccessible once the level drops below that of the hose outlet? Are those MOLLE fittings on the flap? @Clink – It’s been a non-issue so far. I started using the Enduro Backpack earlier this year in the middle of winter, and had a lot of wet and mucky rides with it. The flap actually shields the inside of the pack surprisingly well. @angeldust – I thought exactly the same thing when I first saw it! There’s a bit more effort required to get the last few drops of water, but otherwise it just works as normal. The key seems to be removing as much air as possible before you do up the main cap on the bladder. @ian – It appears to be so, though I don’t have any PALS myself to try it out. There are belts and loops all over this pack for those who want to attach a lot more to it. Does the space for the bladder lend itself to a horizontal bladder like the one that comes with the source hipster? I found that bizarrely the space in the hipster for the bladder isn’t long enough for the ‘wings’ on the bladder to fit. Do Henty recommend a particular bladder? @mrback I believe that all orders go through that henty.cc site (you can then select UK as your delivery country). You can contact melissa@henty.cc if you want to avoid the time zone delay with any queries – she is based in the UK. Hello Singletrack readers, Melissa here from Henty. We are currently looking for UK stockists. If people have suggestions please do send me an email melissa@henty.cc but for now they are available through our website http://www.henty.cc making sure you click through to the UK page of the site. Very best, Melissa. @henty – I’ve got some Q’s, I’ll drop you an email. You have terrible bruises after using this backpack. Is it convenient for you? I also use a backpack, only for fishing. He is always heavy. There are always a lot of coils in it. But there are no such problems with the skin. You can choose something more practical and new for yourself http://www.henty.cc It will make your rest easier.